In our previous update, we mentioned that we had to switch columns within Artisan’s Asylum. We didn’t mention HOW we switched columns. We’d like to take a moment to amuse you with the rather ridiculous, 20-30 minute process we used to get a stuck base mount off the column… set to the Benny Hill theme. We have come to realize that a) we are bad at this continuing-to-write-blog-posts thing, and b) even so, we really need to be documenting this process for the world to see. Thus, we’ve decided to change gears a bit and offer weekly video updates instead of blog posts. Check out our first update below! Let us know what you think, and if you have anything you’d like to learn more about! We are happy to report our prototype leg’s first movements! We are equally happy to report that it takes roughly 600 pounds of force to crush a Macbook G3. Just a quick update to announce that all swag (t-shirts, bumper stickers, wrist bands) bound for US addresses has shipped or will ship by end of today. For US supporters – your shirts and bumper stickers should arrive before Christmas. International swag has not yet shipped and we’ll let you know when that goes out. We will definitely be shipping international orders before Christmas, but I wouldn’t count on them arriving before Christmas. Received all of our swag! So to all our Kickstarter backers, your stuff should be arriving in the next month. It’s taken us longer than we expected, and for that we apologize. We still need to pack and address over a thousand packages, but we have all the equipment in place to do it. 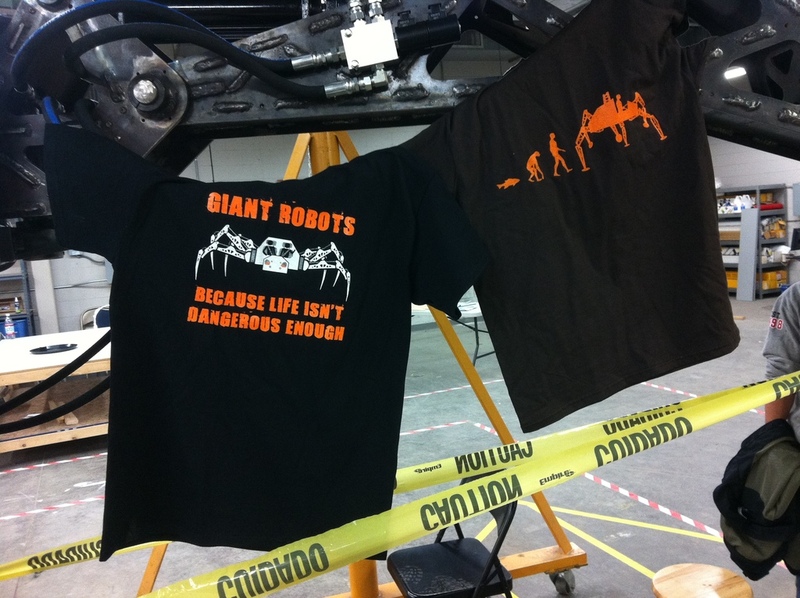 On the robot side of things we’ve also hit a few milestones. Yesterday we finished structural assembly of the prototype leg. It looks awesome, so we’ll start with some pictures and then tell you everything that went in to it. First of all, we owe everyone a huge thank you – your response has been tremendous through this entire Kickstarter campaign. We hit our goal, and we’re only $2,500 away from our Performance Upgrade – woohoo! We wanted to take a minute and show you the progress we’ve made over the past month while the Kickstarter was up, and ask you to help spread the word (or perhaps up your pledge!) to help us achieve our $95,000 stretch goal. 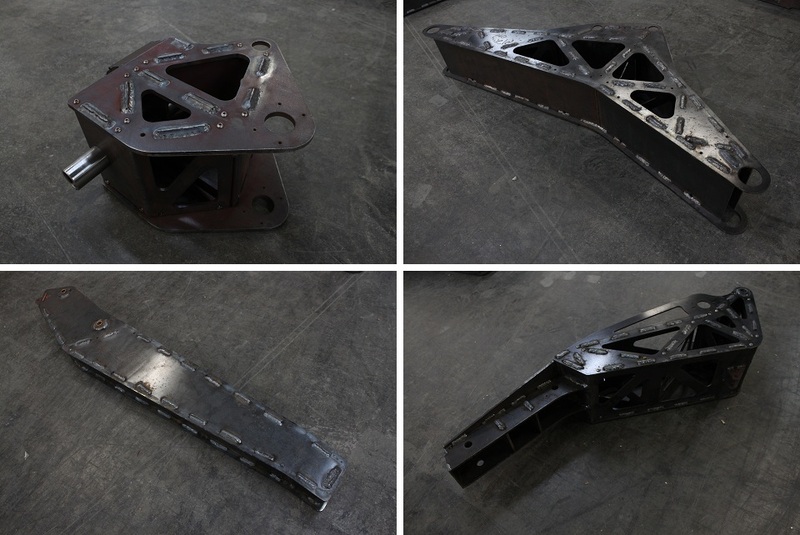 Hello all, M@ here with an in-depth look at what exactly goes into assembling an unbelievable giant hexapod robot. Normally I do controls (software) and document our efforts, but today I’m helping with the physical building process. Before I get started, let me first say what a great honor it is to have had such an amazing Kickstarter response, your faith in our project blows me away. We’re just as excited about this project as you are… it’s incredible… it’s going to be great! It’s been less than a week since we launched our Kickstarter and we are 72% funded. This is mindblowing! Thank you everyone for donating, for spreading the word, and for believing in us. We’ve received a couple of requests about the code repository and realized we haven’t ever publicly shared the link. Presently the central repository is a collaborative sandbox and full of experimental code, we will be separating a release branch out soon. In the meantime, the link for the curious is here. We’ve also had generous offers from remote developers who want to help. Thank you! We’ll be figuring out the right way to incorporate public contributions as we clean up the repository, stay tuned. Heightmapped terrain is now supported in the simulator. This will let us simulate much more complex and interesting situations than we could previously. Here’s a short demo of what that looks like with Stompy walking blindly forward. The ground is red in honor of the Mars landing.